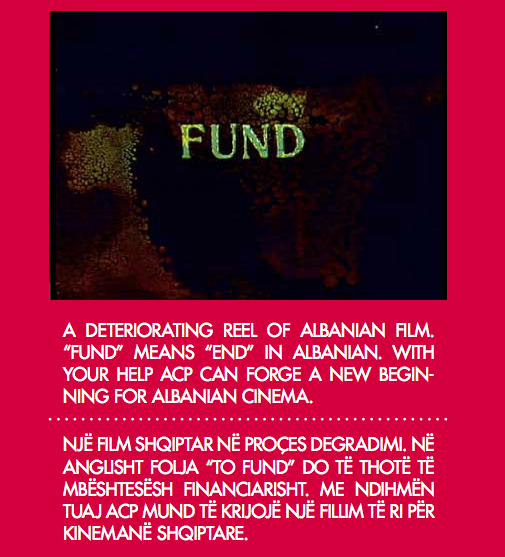 The Albanian Cinema Project is no longer accepting donations, effective December 31, 2017. The Albanian Cinema Project forged partnerships to fund our audiovisual preservation work and our educational initiatives, including t﻿he Archives in Motion (AIM) Workshops﻿. All donations were tax deductible through The San Francisco Media Archive. ​FILM RESTORATION: 35mm sound film runs at 24 frames per second. This means that it costs a little over $2 to preserve one frame of film and $50 to preserve one second of film. HERITAGE PRESERVATION: A general donation to ACP will support the cleaning of all film elements and the eventual move to a mold free facility. The time has come to bring Albanian film heritage to the world. While Albania leapt into the 21st century, the Albanian Film Archives remain shrouded in darkness. The Albanian Cinema Project is working overtime to bring Albania’s rich cinema history back into the light. Our ultimate goal is to build a new archives and exhibition space in Tirana, Albania, as well as to restore more Albanian Films for worldwide exhibition and distribution. To achieve this, we have partnered with film preservation labo-ratories and film festivals throughout the world to preserve 5 Albanian films in 5 years. Each of these films will screen first at film festivals and then to larger audiences. The vaults where the films are currently stored are in very poor condition. The roof has been patched several times, but still leaks. The walls and floorboards are also leaking, moisture, mold and mildew have crept into all these cracks. The mold spores are in the air and have even entered many the film cans, causing damaging mold growth on the original camera negatives and the projection prints. The staff of the archives are constantly cleaning and re-cleaning these film reels to try to keep the damage at bay. They are exposing themselves to harmful mold without proper ventilation while performing this important task. The building is the root of the problems and it cannot be salvaged, so we are seeking alternate long term storage options for the film, photo and paper collections through our partnerships with the Albanian Ministries of Culture and Defense. 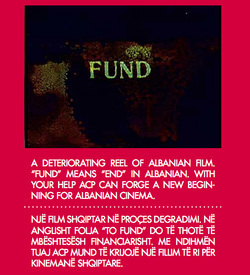 A general donation to The Albanian Cinema Project will provide funds to support the cleaning of all film elements and the eventual move to a mold free facility. Please click on the link above and enter any amount that you wish to donate securely with PayPal. Please include your name and return address on mailings so that we can be sure to send you a receipt for tax purposes. Please note that donations via snail mail will take longer to process than PayPal.